Black horses have always had a special significance to me. I am delighted to have obtained this beautiful work of art by AmyLyn Bihrle as the logo for Black Horse Spirit. 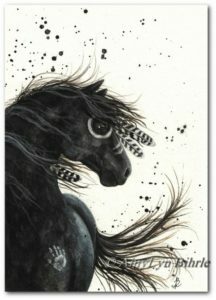 Each symbol on the Black Horse has its own specific meaning and purpose. This horse is decorated with carefully chosen symbols of power which are intended to give protection and which speak of his courageous heart. They are based on the symbols used by some Plains Indians on their war horses (which were not standardized by any means). I can’t say what they meant to AmyLyn when she painted this horse, but I can say what they mean to me, based on what I know of horse war paint. The white-colored paint symbolizes mourning, but might also mean peace. I like both meanings combined, which for me conjures the idea of a peaceful journey or crossing to the Otherworld. For me, the white color indicates that any battles referred to by these symbols are of a spiritual nature. The circle around the horse’s eye is intended to give the horse alert and far-seeing vision, which (for me) is indicative of one who has the Second Sight and is able to “see” into the Otherworld. The hand print outlined upon the horse’s chest shows that he has knocked down an enemy (metaphorically speaking, in my horse’s case). The coup feathers mean the horse has carried his rider through the risk of injury or death and both came through unscathed. This horse has three coup feathers, a sacred number and a number of personal significance to me as well. The bars on the horse’s nose indicate the number of battles horse and rider have been through together (indicates trust and strong partnership). Finally, this horse looks like an uncanny combination of my Connie and my Alf, both of whom, when they crossed the Veil, became my spiritual mounts and helping allies in the Otherworld. This horse is, therefore, the perfect symbol for my practice.